Fancy upgrading your eggsisting chicken house to an Eglu Cube? 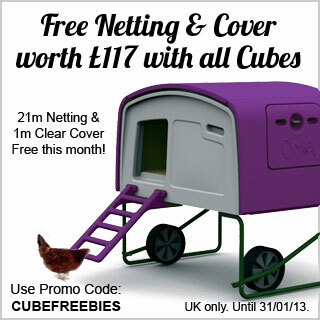 If you want an easy-to-clean, stylish house for up to 10 hens, the Cube is an eggcellent choice, and this month we have a fantastic offer for you. Buy any Eglu Cube throughout January and we will throw in a 21m Omlet Chicken Netting and a 1m Clear Cover, worth £117, for free! Our Chicken Netting is a great way of giving hens some extra room to free range in, while keeping them out of your prized vegetable patch, and the Clear Cover will provide a sheltered spot in the run when it’s raining. This offer is valid in the UK, until January 31st. 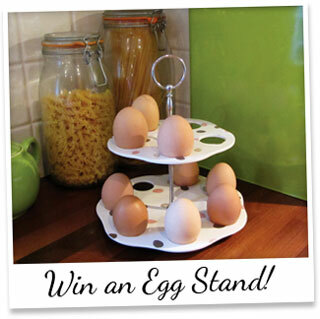 Win an Omlet Egg Stand! For your chance to win, tell us how many eggs the two tier and three tier egg stand hold. Email your answers, along with your name and address, to stephanie@omlet.co.uk using subject line ‘Egg Stand Competition’. Competition closes Friday 18th and we will select three winners at random from all correct entries. Good luck! 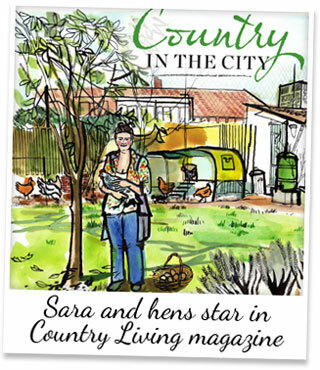 It’s always eggciting to see our happy customers in magazines, and this month chicken keeping eggstraordinaire Sara Ward has starred in Country Living Magazine. She was the perfect candidate for their article titled ‘Country in the City’…and here’s why. Sara moved to her end-terrace home in West London five years ago, and after being on an allotment waiting list for quite some time, she decided to transform her garden into an urban smallholding of her own. Starting with just a couple of chickens, her passion for the Good Life grew. She now has 11 chickens in an Eglu Cube and an Eglu Go, several thousand bees in a Beehaus, numerous fruit trees and a plenty of veggie-filled raised beds. Sara turns her fruit into jams, chutneys and liquers, bakes her own bread and makes her own cheese, and her honey won 1st prize for London at the National Honey Show last year. Sweet! As if she wasn’t busy enough, Sara writes a regular blog and runs several courses so that you, too, can learn how to live a country life. In the article she says “none of this really has to take that much time if you learn how to weave it into daily life.” Well, that’s a relief. Sara’s courses kick off again in Spring, and they can be booked through our website. Here are some examples, and be warned, they do book up quickly! You can read the article in the February edition of Country Living magazine, on sale now.